Develop your skills in songwriting, singing, performance, production, instruments, and more! Stages is a great place to meet like minded musicians. Our experiences team cover all genres from hip-hop to jazz, metal to pop and everything in between. 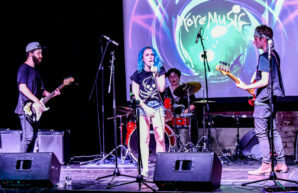 If you want to learn how to play drums or guitar, join your first band, rehearse ready to play gigs or join the brand new Stages Super Group, complete with horn and strings section, Stages is the session for you. We will provide support and guidance no matter what stage you are at in your musical career.